Here's a statistic from November 6: Republicans lost the popular vote by more raw votes than any time in history. But because of gerrymandering, many of those votes for Democrats piled up disproportionately in just 40 congressional districts, rather than in 80 congressional districts. The GOP leadership is afraid to be introspective because eventually one name and one reason is going to float to the top of their consideration -- DJT and "Mr. Trump’s deep toxicity among moderate voters, especially women." There you have it. There won't be any out-loud soul-searching because these guys are afraid of Twitterman. Better to eat a Danish and drink a cup of acid, because the next two years are going to be full of peptic upset anyway. 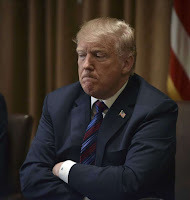 "What alarms Republicans even more is that the possibility that disgust with Mr. Trump will be uncurable in 2020, when he will most likely be on the ballot, no matter the party’s agenda .... This sort of cold-eyed assessment has Republicans already expressing concern that more of their colleagues may retire rather than run again in 2020 — and that recruiting top-flight candidates could prove even more challenging going into the next campaign." So we're starting our short-timer's countdown calendar now: How many Republican members of Congress will choose to retire rather than run for reelection in 2020?